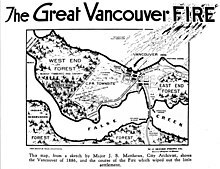 The Great Vancouver Fire was a conflagration that destroyed most of the newly incorporated city of Vancouver, British Columbia, Canada on 13 June 1886. Map showing the course of the fire. The fire began as a bush fire to clear land between present-day Main and Cambie Streets that was spread out of control by a strong gale. Dozens of lives were claimed by the fire and the only structures not destroyed were a stone building in the West End, the Hastings Mill Store, and a few structures on the banks of False Creek. An estimated $1.3 million was lost in destroyed property, but within four days, new buildings began to appear. Shortly after the fire, $6,900 was raised for fire-fighting equipment and a fire hall and water tanks were constructed. Vancouver's lone constable, John Stewart, was joined by Jackson Abray, V.W. Haywood, and John McLaren when Mayor McLean appointed them special constables to assist in the aftermath of the fire, marking the creation of the first police force for the city. The city was rebuilt with modern water, electricity and streetcar systems.